Ling and her family have been reunited with Cookie. They found her in the compounds of a school nearby. Cookie, a Shih Tzu, ran out of Stomper Ling's flat in Block 148 Toa Payoh Lorong 1 on Jan 1. She is six months old and did not have a collar on when she left the flat at about 8pm. Cookie also needs to take her medication periodically as she has a severe skin issue. Ling said: "I printed posters of Cookie and put them up at the void decks of the blocks nearby. "My family and I have been looking for her for more than 40 hours. "We have also looked at pet shops nearby, but there has been no news. "A resident of the area saw Cookie with a couple at the carpark nearest to the block at about 10pm the night she went missing." 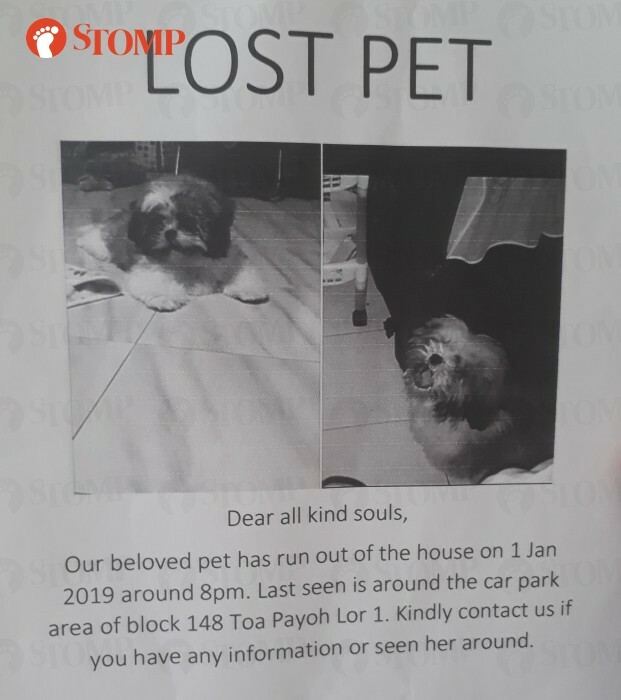 Ling and her family have been anxious to find Cookie and appeal to the residents of Toa Payoh and anyone who might see her to bring her back. "We are all very worried and would like her to come home," she added. If you have any information about Cookie, kindly contact us at stomp@stomp.com.sg or WhatsApp (+65) 9384 3761.